Big Walnut’s Jake Summers sprints down the sidelines as Newark’s Louie Cook (9) pursues during the first half of Friday’s OCC showdown in Sunbury. 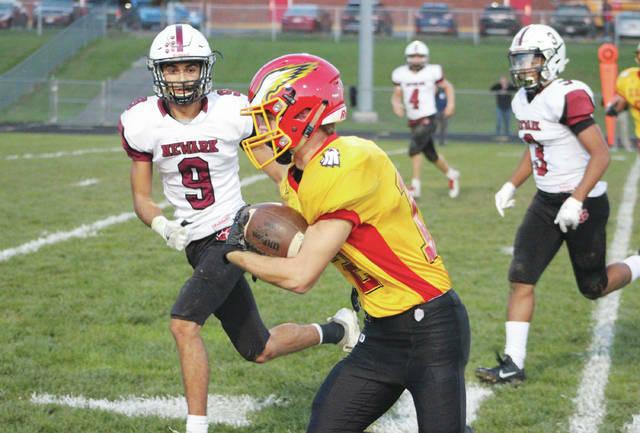 The Big Walnut football team broke out of its offensive haze in a 37-7 victory over Newark on Homecoming to open OCC-Capital play Friday night in Sunbury. The Golden Eagles broke out for 394 yards of total offense after averaging a hair over 210 yards and 12 points per game over their last two. One of those responsible for the offensive outbreak was Tyler Crotinger. The junior running back ran for 157 yards and three touchdowns on the ground to pace the Golden Eagles (2-4, 1-0), who ran for 247 yards as a team. Another was Nathan Lawyer, who found the end zone on the ground and through the air as the Eagles built a 15-0 lead early in the second quarter. Crotinger scored on a 4-yard run with a little over a minute left before the break and Lawyer ran in the two-point conversion to give the Eagles a 23-7 edge at the half. But, BW left a lot of points out there, too. The Eagles turned it over on Newark’s side of the field twice and turned it over on downs once. The turnover on downs, which happened on BW’s first possession, eventually led to a safety. A low snap forced Newark punter Garrett Kashner’s knee to the ground in the end zone to give the Eagles a 2-0 lead with 6:35 left in the first. Jake Summers caught short pass from Jagger Barnett and ran it 19 yards to Newark’s 1 to set up Lawyer’s rushing touchdown to push it to 9-0 with 1:46 left in the first. Jakob Daniels recovered the ensuing kickoff at Newark’s 38, but the Eagles couldn’t add to their lead, going three-and-out. Lawyer caught a 37-yard touchdown pass over the middle on a skinny post to push the Eagle lead to 15-0 with 9:08 remaining in the half after a Newark three-and-out. Quarterback Jake Sherman broke a 45-yard run down to the BW 10 on the Wildcats’ next possession. But, Nathan Montgomery stepped in front of his pass in the end zone on the next play to thwart that scoring bid. Crotinger broke a 50-yard run two plays later to get the Eagles in Newark territory again. But, Darren Haile intercepted Barnett on the next play to get it back for the Wildcats. Dustin Williams scored from 18 yards out, going down the right sideline to get Newark on the board – down 15-7 with 4:06 left in the second. Crotinger found the end zone for the second time midway through the third quarter. He capped a nine-play, 39-yard drive with a 5-yard touchdown run. Barnett finished with 147 yards passing with 13 completions on just 16 attempts. He scored from 3 yards out with 36 seconds left in the game to account for the final margin. Max Lenz had 5.5 tackles, Lawyer had 1.5 tackles-for-loss and Sam Elliott also had an interception to lead the Eagle defense, which held Newark to just 137 yards of total offense. Mason Wheeler had 51 yards on seven carries and Sherman added 45 yards on the ground to lead the Wildcats (1-5, 0-1). Next up, BW continues league play with a trip to Franklin Heights Friday night at 7 p.m.